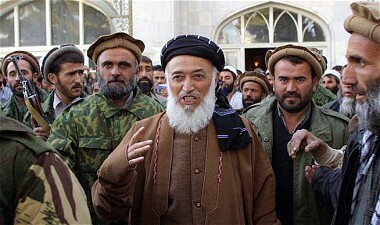 The head of Afghanistan’s High Peace Council, former President Burhanuddin Rabbani, has been killed by a Taliban suicide bomber at his home close to the American embassy in Kabul. Four aides were also killed in the attack, for which the Taliban claimed responsibility on Tuesday night. The bomber detonated explosives hidden in his turban as he embraced Prof Rabbani. A senior adviser to President Hamid Karzai, Mohammed Masoom Stanekzai, the chief executive of the Afghan Peace and Reintegration Programme, was seriously injured in the attack, although his condition was not believed to be critical. Fazel Karim Aymaq, a member of the High Peace Council, said two â€œvery trustedâ€ figures had come to Prof Rabbaniâ€™s home in Kabulâ€™s upmarket Wazir Akhbar Khan neighbourhood with â€œspecial messagesâ€ from the Taliban. â€œOne of them put his head on the shoulder of Rabbani and detonated the explosives hidden in his turban,â€ he said. Another council member, Habibullah Fawzi, said the bomber, who was â€œwearing Afghan style clothes â€“ shalwar kamez and turban â€“ came from Quetta to Kabul with a message of peace from the Taliban. â€œHe met Rabbani and Stanekzai. Rabbani was expecting him. He was supposed to be a key member of the Taliban. They discussed peace and after the meeting was over Rabbani stood up to wish this man goodbye. Rabbani and the Talib hugged and that was when he blew himself up.â€ Zabihullah Mujahid, a Taliban spokesman, claimed responsibility, saying that the killer had gone to Prof Rabbaniâ€™s home for talks. â€œAs soon as Rabbani came three steps forward to hug Mohammad Masoom, he triggered his explosive-filled jacket killing Rabbani, [another] Taliban militant Wahid Yar and four security guards present at the house,â€ he told a news agency. Mujahid said the Talibanâ€™s central leadership had appointed two â€œarticulate and well-trainedâ€ fighters â€“ Masoom and Yar â€“ to build contacts with Prof Rabbani. â€œBoth of them were frequently meeting him at his Kabul home and secured trust of Rabbani and his guards. They were telling Rabbani that they would soon bring senior Taliban leadership to the negotiating table with him,â€ Mujahid said by phone from an undisclosed location. Michael Semple, a Taliban expert and former deputy European Union special representative to Afghanistan, described the attack as â€œone of the biggest blows the peace process in Afghanistan has facedâ€. â€œIt raises the question of whether there is the space for Afghans to talk and whether they can avoid a civil war,â€ he said. William Hague, the Foreign Secretary, said he was â€œappalledâ€ by the attack and paid tribute to Prof Rabbani. â€œHe worked tirelessly for peace and a secure future for Afghanistan and we are confident that this in no way will reduce the determination of the government of Afghanistan to continue to work for peace and reconciliation. â€œI will be discussing that with foreign minister Dr Rassoul of Afghanistan at our meeting this week,â€ Mr Hague said. President Barack Obama also condemned the attack, while Mr Karzai, who announced he was cutting short his trip to the United Nations general assembly, described Prof Rabbani as a martyr who had sacrificed his life for peace. â€œThis is a sad day for us in Afghanistan but a day of unity and day of continuity for our efforts,â€ he added. A spokesman for the United States embassy in Kabul confirmed that the attackers had struck close to its building, but said it had not been the target of the attack. General John R Allen, the commander of the International Security Assistance Force in Afghanistan, said the killing was â€œanother outrageous indicator that, regardless of what Taliban leadership outside the country say, they do not want peace, but rather warâ€. Prof Rabbani, an ethnic Tajik, was a hero of the anti-Soviet resistance in Afghanistan and his Jamiat-e-Islami were the first Mujahideen fighters to enter Kabul after the Soviet withdrawal in 1992. He was president from 1992 until his regime was ousted by the Pashtun-led Taliban in 1996. He was appointed to head the peace council last year despite his leadership of the opposition Jamiat-e-Islami.